Tuesday was my birthday and I wanted to make something yummy for my birthday. That is right, I am made my own birthday dessert (I know that my fellow food bloggers will understand this quite well). 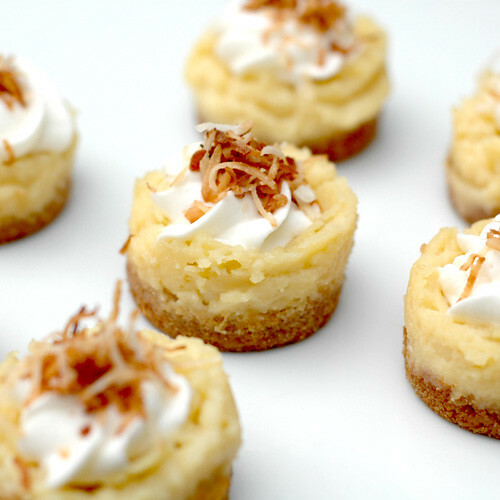 Now my first thought (of course) was to make a super fun cupcake that I hadn’t tried yet, but then I remembered these delicious mini cheesecakes that I made this past fall, and I knew that was what I wanted. The ones I made in the fall were raspberry, but for some reason I have been on a lime kick lately, so I came up with the idea of a key lime flavored cheesecake. I knew that someone somewhere had created one already and I was right. I found a recipe at Smitten Kitchen and low and behold she even made them mini like I was looking for! In her blog I also noticed she had a neat mini cheesecake pan. I had never seen one of these before and was immediately fascinated so I hopped on my favorite gadget buying site, eBay, and found one for a good deal! This pan is adorable, that is if a pan can be adorable, and it makes adorable little bite sized desserts. How perfect is that? I digress…on to the recipe. The original recipe from Gormet, May 2002 was made for a full cheesecake and our friends over at Smitten Kitchen used half the recipe to make 12 mini cheesecakes. The recipe that I show below has been reduced and will yield 12 mini cheesecakes (with a little bit extra), that is why some of the measurements are a little odd. The original recipe also called for lime soaked mangoes to garnish the tops of the cakes, however I am not a big fan of mango so I decided to go with coconut. After reading the Smitten Kitchen blog she put the “lime in the coconut” song in my head and I couldn’t get it out. I even played the song and sang it a lot while I was baking these. That song is addicting! I also used cinnamon gram crackers in the crust as this is my favorite way to make a cheesecake crust (my super fabulous cousin Hallie gave me the idea). Make crust: Preheat oven to 350°F. 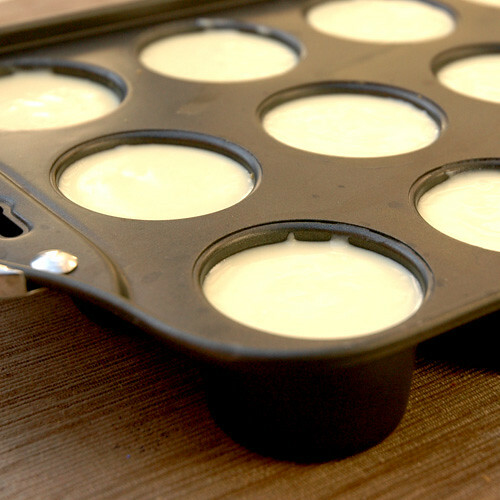 This recipe can be made in a mini cheesecake pan or in a muffin pan with or without papers. Stir together crumbs and butter in a bowl with a fork until combined well, divide the crumb mixture into the 12 holes of your mini cheesecake pan (or muffin cups) then press evenly onto bottom of each hole of the pan. Bake crust in middle of oven for 4-5 minutes and cool in pan on a rack. Make filling: Reduce oven temperature to 325°F. Beat cream cheese with an electric mixer at medium speed until fluffy, then beat in sugar. Add lime juice, sour cream, and vanilla and beat until smooth. Mix in flour and salt at low speed, scraping down side as needed, until just incorporated, then add eggs all at once and mix just until incorporated. Run a thin knife around edge of each cake and push up to remove from the pan. Make topping: Place the shredded coconut in a saute pan and heat over medium heat on the stove until lightly toasted (it is important that you watch it closely as it can burn very quickly). Beat cream with sugar in a bowl with electric mixer until it just holds stiff peaks, then spread or pipe on top of each cheesecake. 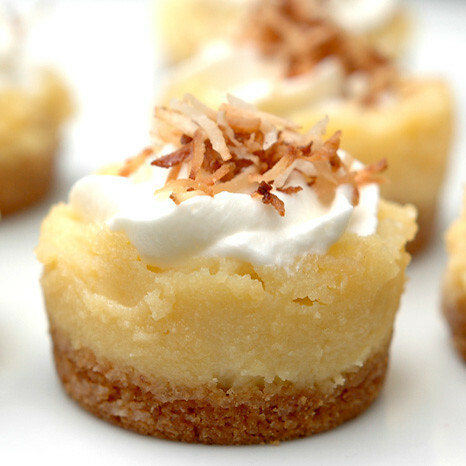 Then place the toasted coconut on top of the whipped cream and enjoy your bite sized treat!